To understand 5-MTHF a bit better, one needs to first describe Folic acid and Folates. Folic acid is actually an artificial B vitamin created, and then added to foods like baked goods, and also available in most multi-vitamins. Folates on the other hand, are naturally occurring in foods and occur in a few different forms, which is why we call them folates. Folate, while it's an important and essential vitamin by itself, is unusable by the human body and has to be converted through a series of steps to the active, useable form of folate called 5-MTHF (5-methyltetrahydrofolate). 5-MTHF is a critically important co-factor in a variety of essential chemical reactions in the body, which means it makes those reactions actually take place. 5-MTHF -Why is it important? It's critical for the normal development of the nervous system when we are developing in our mother. This is why folic acid is added to foods, because it helps reduce spinal cord problems in babies. It is involved in the "detoxification" of homocysteine. Homocysteine is a toxic product of the SAM reaction, (S-Adenosyl methionine), meaning that homocysteine is toxic and needs to be recycled back into nontoxic methionine or cystathione. If this does not happen, it can build up and damage our blood vessels, leading over years to the formation of plaques. (Clogged arteries which greatly increase the likelihood of heart attacks and strokes). It has also been linked to Alzheimers and dementia. It is important to make sure that homocysteine is effectively being recycled. 5-MTHF along with Vitamin B12 is critically important in this step. 5-MTHF is essential in the production of neurotransmitters, those brain chemicals which control our mood, our ability to think, generating movement, speaking, thinking, listening, regulating the systems of the body, and countless other functions. 5-MTHF also helps recycle another cofactor called BH4, (tetrahydrobiopterin), which is directly involved in the production of serotonin, dopamine, norepinephrine, epinephrine, and nitric oxide. This is why it is suggested that patients expressing certain psychiatric conditions, (depression, bipolar disorder, schizophrenia) or neurologic indications (including autism, ADD / ADHD) should request their physician to consider 5-MTHF treatment. Is also involved in the production of DNA. We have two sets of genes, (one from mom, one from dad). If you have a mutation in one you are called heterozygous, if you have a mutation in both you are called homozygous. If you are heterozygous for the mutation your 5-MTHFR enzymes, (the enzyme that makes 5-MTHF), does not work well, meaning you produce less 5-MTHF than required, if you are homozygous your enzymes work very poorly indeed, meaning you make MUCH less 5-MTHF. 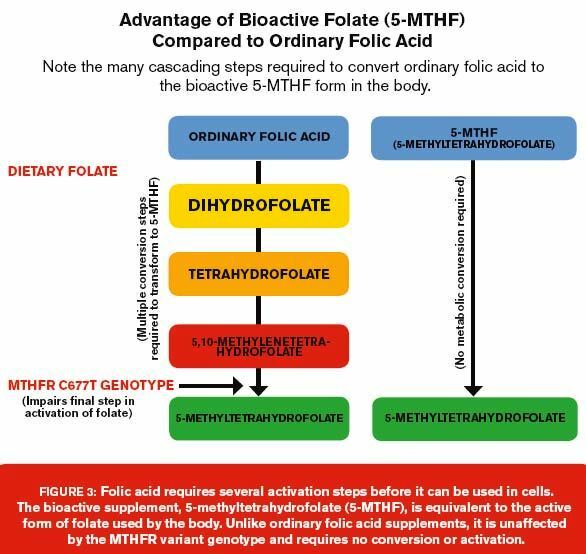 Folic acid / folate, as already said, is not usable by the body until it is converted into 5-MTHF. According to studies in US, Caucasians are around 50% heterozygous for the MTHFR mutations, and about 10% homozygous for MTHFR, and because this is a genetic issue, you will often see these concerns running strongly in families. If a person has been struggling with depression her whole life and her siblings or parents or grandparents also expressed depression indicators, or other psychiatric or neurologic indicators, there's a good chance there may be links to 5-MTHFR mutations. One of the reasons miscarriages occur may be 5-MTHFR mutations as per above. Testing and/or supplementing with 5-MTHF may be all that's required. See an interesting 5-MTHF/Folic Acid comparison here. A genetic test is available, and your physician can order it. Since it is a genetic test, it only needs to be done once in your life. If tested positive for 5-MTHF deficiencies and MTHFR mutations, your physician can prescribe 5-MTHF treatment/supplementation. Your Solution Compounding Pharmacy can compound 5-MTHF to the correct strength and dosage, without colourants and fillers to which many patients are allergic. Please note that certain side-effects of using 5-MTHF may indicate not just 5-MTHFR disorders, but significant additional methylation problems, and could require further and additional treatment. Your Solution Compounding Pharmacy regularly compound scripts for these patients as well. 5-MTHF is necessary to produce all your neurotransmitters. For some people taking 5-MTHF really is magic. One doctor reports having treated more than 4 000 patients. The solution though is to 'listen to your body'. If you have any problem with mood or behaviour, or with your nervous system, ask your doctor to test for 5-MTHF mutations. It may just make all the difference. Please contact Your Solution Compounding Pharmacy for more information about 5-MTHF or visit us at 1/6 Pine Rivers Office Park, 205 Leitchs Rd. Brendale, QLD. 1. Bailey LB, Gregory JF (1999) Folate metabolism and requirements. J Nutr 129: 779-782. Cortese C, Motti C (2001) MTHFR gene polymorphism, homocysteine and cardiovascular disease. Public Health Nutr 4(2B): 493-7. 3. Gilbody S, Lewis S, Lightfoot T. Methylenetetrahydrofolate reductase (MTHFR) genetic polymorphisms and psychiatric disorders: a HuGE review. Am J Epidemiol. 2007 Jan 1;165(1):1-13. 4. Ismaili, S (2010) Crossover comparative bioavailability study of 5-methyltetrahydrofolate glucosamine salt compared to the reference Metafolin® in healthy volunteers. IPSA-5MTHFA-583-09 Final Report. 5. Lamers Y, Prinz-Langenohl R, Bramswig S, Pietrzik K. Red blood cell folate concentrations increase more after supplementation with [6S]-5-methyltetrahydrofolate than with folic acid in women of childbearing age. Am J Clin Nutr. 2006;84:156-161. 6. Marini NJ, et al. (2008) The prevalence of folate-remedial MTHFR enzyme variants in humans. PNAS 105: 8055-8060. 7. Miller, A. (2008). The methylation, neurotransmitter, and antioxidant connections between folate and depression. Alternative Medicine Review, 13(3), 216-226. 8. MRC Vitamin Study Research Group. Prevention of neural tube defects: results of the Medical Research Council Vitamin Study. Lancet. 1991;338:131-137. 10. Selhub J (2002) Folate, vitamin B12 and vitamin B6 and one carbon metabolism. J Nutr Health Aging 6(1): 39-42. 11. Yigit, S., Karakus, N., & Inanir, A. (2013). Association of MTHFR gene C677T mutation with diabetic peripheral neuropathy and diabetic retinopathy. Molecular Vision, 19, 16261630.